SAINT JOHN, N.B. 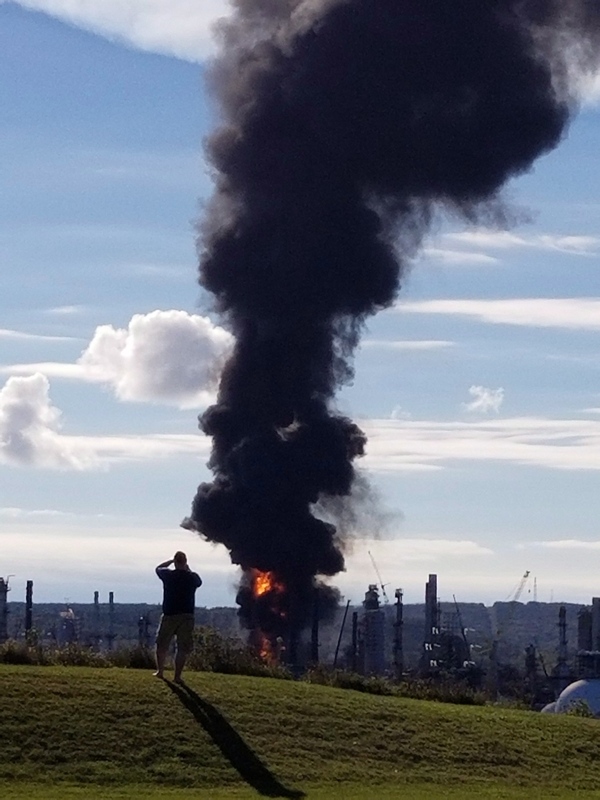 -- A massive oil refinery blast shook this historic port city Monday, sending flames and black smoke high into the sky but causing only four minor injuries -- and leaving officials relieved it wasn't far worse. "We're very grateful today -- and being Thanksgiving, I think it's appropriate," Kevin Scott, Irving Oil's chief refining and supply officer, told reporters at an afternoon briefing after a tense day. "Very fortunate they had only minor injuries." 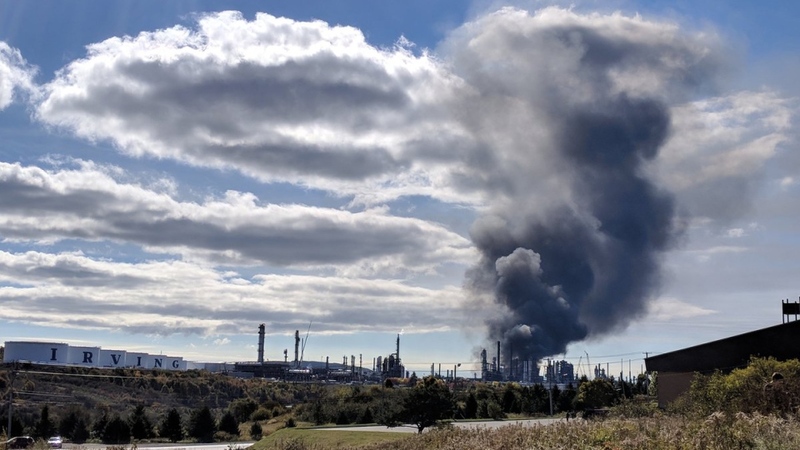 Saint John residents described feeling an explosion at about 10:15 a.m. local time, at Irving's refinery on the city's east side. "My whole house shook. I thought my furnace had exploded," said Litsa Daeres, 34, who opened her curtains and saw the flames and thick, black smoke. Scott said there had been a malfunction in the refinery's diesel treating unit, where sulphur is removed from diesel fuel. One worker at the refinery, who didn't want to be identified, said the initial blast had been enough to knock him down. "There was quite a shockwave when the blast happened," he said as he left with co-workers hours afterward. There were as many as 3,000 workers on the refinery Monday -- but most of the facility was shut down for major maintenance, and nearly all of the workers were contractors working on the turn-around. Scott said the unit was quickly shut down after the blast. "The fire did take a number of hours to extinguish, with some of the material that had leaked into the area of the unit that was affected. At times we were letting that just safely extinguish itself," he said. Most of the minor injuries were to contractors, not Irving staff, he said. The refinery is near several residential neighbourhoods, and is about five kilometres from the city core, known as Uptown. According to the Irving Oil web site, the refinery produces more than 320,000 barrels of "finished energy products" every day, with more than half going the U.S. northeast. Scott said they hope to minimize the impact on clients. 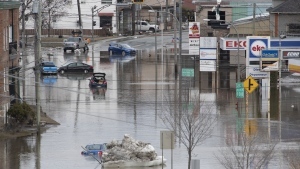 The City of Saint John posted on social media Monday evening that residents in the area were no longer being asked to "shelter in place," and police tweeted that all roads had been reopened. District Chief Mike Carr of Saint John fire said there were no air quality concerns, other than the smoke. "At this time, the incident is stabilized," said Carr. The thick, black plume of smoke earlier in the day had been cause for concern for Gordon Dalzell, who lives in the nearby subdivision of Champlain Heights -- but the bigger issue, he said, is the other pollutants in the air that can be neither seen nor smelled. Dalzell, the chair of Saint John's Citizens Coalition for Clean Air, said the refinery already emits many different types of "volatile organic compounds" into the air: organic chemicals that have a high vapour pressure and can be hazardous to human health. "Obviously, there was a lot of black, sooty smoke ΓÇª but I worry more about what you can't see in terms of pollution that comes from the refinery," he said. "The pollutants you can't see or smell, they're the ones that are of great, great concern, on a regular basis." He said he was grateful that nobody was seriously injured, but he hopes the incident will help stakeholders reconsider the continued use of fossil fuels when greener options are available. Like others in the area Thanksgiving morning, Dalzell was shocked by the initial explosion. "Our house actually shook, our windows, we could feel the direct impact of the explosion in our house ΓÇª it didn't take very long to discover, of course, that a very heavy black plume was coming from the site," he said. "We thought we were going to have to evacuate and take the turkey with us." "There was thick, pitch black smoke mixed with white smoke," said Guimond. "I heard a rumbling, roaring sound." Michael Steeves said he was driving about a kilometre away when he saw flames reach as high as 100 feet in the air. He said the incident reminded him of a similar event in the late '90s, when the same refinery suffered a similar explosion which left one person dead. "Just seeing the clouds, and what they've got closed off, it just seems to be a pretty similar level of event," he said. The Saint John Regional Hospital had issued an "orange alert," meaning it was preparing for a possible influx of patients. But the health authority later tweeted that the hospital "is running as usual today." With files from Alex Cooke in Halifax and Alanna Rizza and Nicole Thompson in Toronto. We can confirm we have now treated five people with injuries from the refinery explosion at Horizon’s Saint John Regional Hospital and all five have been discharged. We can confirm that a major incident has occurred at our Saint John refinery this morning. We are actively assessing the situation at this time and will share more information when available. Police are currently responding to an incident at the Irving refinery. Please avoid the area. #SJEMO update: Saint John Fire & Police remain on scene at the Irving Oil Refinery incident in east Saint John. Roads in immediate area have been closed to thru traffic. At this time, no evacuations have been ordered for residents. Explosion at oil refinery in N.B.